This is part 2 in a series on fishing rigs. The Carolina Rig is most helpful when fishing brush and downward slopes. Learn all the parts of the Carolina Rig. Learn how to tie it, bait it, and how to fish with it. Tie one end of the leader line to the barrel swivel and set it aside. Next, place the glass bead, brass bead, or rattle chamber behind the sinker weight. Tie the main line to the other end of the barrel swivel. Now, tie the end of the leader line to your hook. 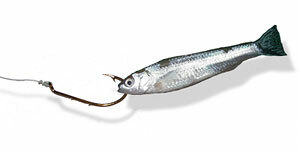 Hooking bait to the Carolina Rig is exactly the same as the Texas Rig. If you use a minnow hook it just behind both lips. This keeps the minnow alive, and allows it to swim freely. When tying your tackle to your line use the Clinch Knot. You would not want to use the Corlina Rig around Dams or levees since the heavy weight would get hung up on the rocks. The best place would be on a downward slope where you can present the bait off the bottom. The Carolina Rig is also excellent in reeds and brush since you can weave the bait around and through cover at variable depths with its ability to be weedless. The best presentation is to cast beyond your target area and slowly give the line a tug and allow the bait to freely move about. No need to keep your line very taught since the weight will pull the bait down. Reel in the slack a bit and give the line another tug. Use your imagination as to how a fish will see the bait moving slowly with variable jolts of speed seemingly to be snaking through the water. Thanks DAWG! Hope the fish are biting in pa.! actually your line need to be taught (especially with bass) because the fish will strike from behind by flaring their gills and suckin in like a vacuum cleaner. the strike can be very hard to detect at time. and many time, in muddy water, bass will hit you sinker becuase of the vibration. set the hook anytime you feel a hit. you'll set the hook on nothing alot, but you'll be surprised with the amount of hookups you get. Good suggestions for bass flytier. A tighter line will also help prevent a bass from swallowing the hook. Thanks for the tips! pounded the bass on a local lake first time with the rig... everyone else using spinners and rapalas... not a hit.. haha thanks for the tips.